You gotta be cool for dis school. And she's just like me, she likes collecting towels and cooking and likes pink! WOW! Lol oh wow, this thread sure isn't popular! Well, I like Sayaka! I like that she's a bit tomboyish (her role in Kirarin) and she has a "raw" feel to her singing voice. You can totally hear when she's singing, girl is loud. And she has a bit crazy eyes sometimes. Risa es la sal de la vida. Reina es mi reina. I love her (unbelievably nice) abs !!! Sayaka week? !+111 Why didn't you scream it out in the chat shirenu?! Seriously, Sayaka is AWESOME! The future of H!P (alongside Ice Cream). Great voice, also a different sounding voice which is very important. She looks great, great smile.. bit of an Aya Ueto vibe sometimes. Kinda like Aya Ueto and Eri Kamei had a child..
She's definitely got some potential! I really enjoy her voice because it IS different, but still really good. Plus, she's just so darn cute! I really hope now that H!P did their spring cleaning, some more eggs will appear in some more permanent units. Especially her. Hope this thread doesn't fall to the last page.. The question is. How do we keep this thread alive? Obviously there are a bunch of us that would love to see it flourish like a pretty flower. I just.. don't know how to help it along. It's been a while since I saw milky way.. do they even release stuff anymore? 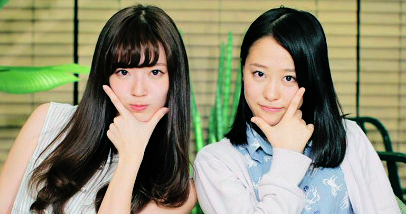 H!P Egg and Milky Way's Sayaka (hopefully she'll join another unit soon)! Download mp3 of San san GOGO, Sayaka solo! I still like her, even though I haven't seen anything from her in aaaages. My Sayaka story: I know her from Milky Way. A moment that made me laugh: That KiraRevo+ series had some awesome moments. A moment that surprised me: That she isn't that popular and hardly featured in anything. This is a girl i like. I would be happy to see her in Morning Musume. Himalias Hello Project Photocard swap shop. Milky Way - Tan Tan Taan! HAPPY SWEET 16TH BIRTHDAY TO SAYAKA!!! So I thought, "WOW she's pretty, she must be one of the beauty Eggs". So she pretty much caught my attention very early on. Well, then time went on and I actually found out that she was more like Yossi than Rika; kinda tomboyish with a low talking voice and plenty of attitude. So I no longer saw her as a beauty Egg, but as someone whose strength was her unique character. Anyway, it seems I've always liked her for different reasons. I hope i can see her perform more. Page created in 0.559 seconds with 20 queries.